Home » Blog » Science of Summer: How Does Air Conditioning Work? At some point in your life, have you ever wondered how air conditioning units blow in the air to cool your home? In the US, around 87% of households use air conditioning units. But, only a few of them are interested in learning how their A/C works. Just like other appliances, air conditioners are complex systems that are difficult to understand at times. 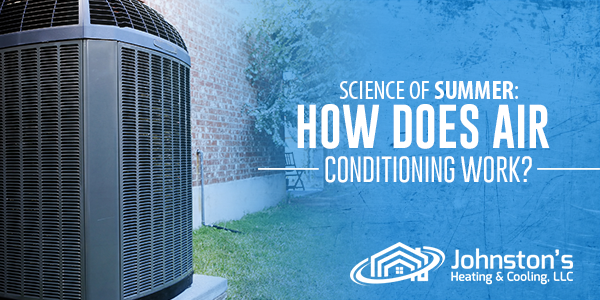 Having a little understanding of what’s going on with your unit is important so, let us have a run-through of the science behind your cooling system. Regardless of the size and shape, air conditioners work in almost the same way. They include two major parts which are the condensing unit and the evaporator. The condensing unit (outdoor unit) is made up of the compressor, fan and a number of coils that serve its individual purpose. Connecting the condenser and an indoor unit are a group of pipes called refrigerant lines. Meanwhile, the evaporator (indoor unit) comprises the fans that transport the air towards the evaporator. The indoor unit pulls in the warm air and converts it to cool air. The conditioned air is distributed to the entire house through the ducts. Did you know that air conditioners use chemicals to convert the liquid to gas and vice versa? These chemicals work to exchange the heat from the outside to the indoor air. The process of blowing cold air and removing hot air inside your space happens when the “working fluid” goes out of the compressor in the form of hot gas. The condensing unit is equipped with metal fins that dissipate the heat quicker than normal. Because of the high pressure, the fluid that passed through the condenser turns into a much cooler liquid. How does the process convert the liquid into gas again? The liquid enters a narrow passage into the evaporator. Once it reached the other side of the channel, its pressure automatically drops making the fluid vaporize into a gas. The condensation and evaporation process continues until such time that your indoor space has achieved its desired temperature or comfort level. 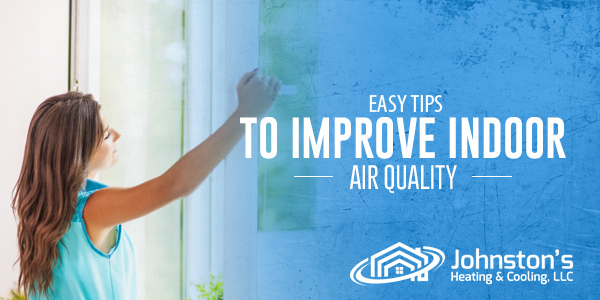 The moment your indoor air becomes warm again, the process repeats. Enjoying the full benefits of your air conditioning unit does not require you to memorize its entire cooling process. Let the experts at Johnston’s Heating and Cooling help you understand your cooling system. Contact us for your questions and comfort needs.